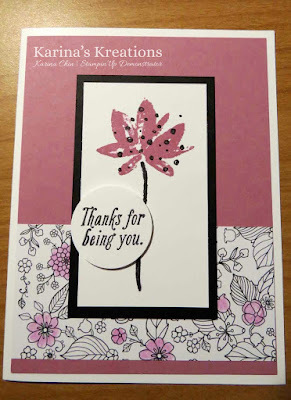 Karina's Kreations: Stampin'Up Avant Garden card! I'm making samples for my catty kickoff party next week and came up with this card using the Avant Garden stamp set #143272 and Inside the Lines Designer Series Paper #143830. Both these items are sale-a-bration choices. You can pick a sale-a-bration item with s $60.00 order. I colored the designer series paper with watercolor pencils #141709 and a blender pen #102845. My card stock colors are Whisper White, Basic Black and Sweet Sugarplum.